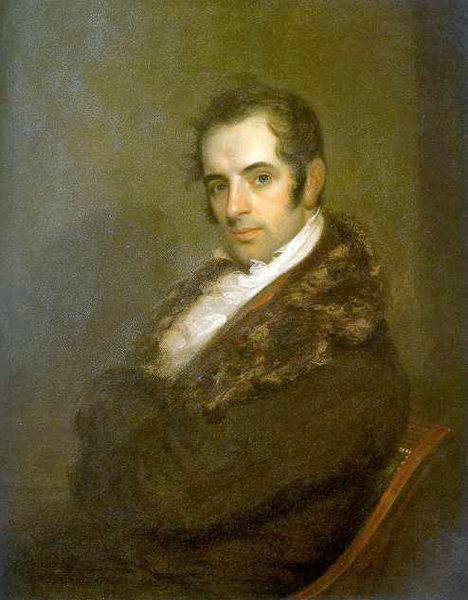 Washington Irving (1783-1859) in 1809, the year he published his account of St. Nicholas. Today being St. Nicholas Day, it seems fitting to reflect a bit on the cultural origins of the American version of that right jolly, old elf. One could argue that any number of people are responsible for “inventing” Santa Claus as we know him today–Clement C. Moore, Thomas Nast…even the marketers of Coca-Cola. Many would point to Washington Irving, that original architect of so much American folklore and tradition. The quote that forms the title of this article is taken from a paper by historian Charles W. Jones, “Knickerbocker Santa Claus,” published in the New York Historical Society Quarterly, in October 1954. Jones challenged the long-standing traditional view that Santa Claus owes his tremendous presence in our culture to Dutch settlers of New Amsterdam (New York). In fact, his research into early colonial New York newspapers, books, diaries and letters turned up no mention at all of St. Nicholas until the time of the Revolution. So, if not rooted in the traditions of Dutch settlers nor the English settlers that followed them, how is it that the “cult of Santa Claus,” as Jones calls the popular tradition, emanated so suddenly from New York in the early 19th century? In short–Washington Irving. The son of Scottish immigrants, Irving studied law in New York, was admitted to the bar in 1806, and promptly decided that an attorney’s life was not for him. In 1807, he established the satirical literary magazine Salmagundi, writing articles lampooning influential New Yorkers, mostly under pseudonyms. Fake names notwithstanding, Irving’s reputation as a brilliant writer spread. In 1809, he was nominated for membership in the New York Historical Society. And here we find the intersection of Irving and Santa Claus. The New York Historical Society was founded in 1804 by John Pintard, a wealthy merchant, antiquarian and philanthropist. It was Pintard who promoted the observance of St. Nicholas Day, December 6, as a holiday in New York. He designated St. Nicholas the patron saint of the New York Historical Society and, by extension, attempted to establish St. Nicholas as the patron saint of the city. All this emphasis on St. Nick caught Washington Irving’s attention. In 1809, the same year he became a member of the New York Historical Society, Irving published his first book, A History of New-York from the Beginning of the World to the End of the Dutch Dynasty under the pseudonym Diedrich Knickerbocker. The book was more satire than history, playing fast and loose with facts, simultaneously romanticizing the history of New Amsterdam while utilizing stories of the Dutch founders to lampoon politicians of Irving’s own time. Before the book was released, Irving implemented a brilliant publicity scheme that would put today’s edgy marketing professionals to shame. He published letters in New York papers under a fictitious name suggesting that Diedrich Knickerbocker, allegedly an old historian of Dutch descent, had gone missing and all that was left of him was his manuscript, A History of New-York. The city was gripped by this mystery. Individuals even wrote in to the editors of various papers claiming that they had seen Knickerbocker and New York officials considered offering a reward for the old man’s safe return. With all this hype, when the mysterious History of New-York was finally published on December 6, 1809, it became an immediate success. And the sage Oloffe dreamed a dream—and, lo! the good St. Nicholas came riding over the tops of the trees, in that self-same wagon wherein he brings his yearly presents to children. And he descended hard by where the heroes of Communipaw had made their late repast. And he lit his pipe by the fire, and sat himself down and smoked; and as he smoked the smoke from his pipe ascended into the air, and spread like a cloud overhead. And Oloffe bethought him, and he hastened and climbed up to the top of one of the tallest trees, and saw that the smoke spread over a great extent of country—and as he considered it more attentively he fancied that the great volume of smoke assumed a variety of marvelous forms, where in dim obscurity he saw shadowed out palaces and domes and lofty spires, all of which lasted but a moment, and then faded away, until the whole rolled off, and nothing but the green woods were left. And when St. Nicholas had smoked his pipe he twisted it in his hatband, and laying his finger beside his nose, gave the astonished Van Kortlandt a very significant look, then mounting his wagon, he returned over the treetops and disappeared. The vision given to Van Cortlandt by St. Nicholas is one of the marvel that New Amsterdam (New York) will one day become. Anything sound familiar in this passage? The smoke of his pipe. A knowing look. Laying his finger beside his nose. All these would be used by New York Professor of Oriental and Greek Literature Clement C. Moore in his “A Visit from Saint Nicholas,” published in 1823. So, by satirically inventing a false tradition of Dutch settlers venerating St. Nicholas, Irving inadvertently gave rise to a very real tradition of Americans venerating St. Nick. This was certainly not the last time in Irving’s career that he would invent folklore which he ascribed to old Dutch settlers. And Charles Jones is not the only scholar to comment on Irving’s ability to give weight to his tales by claiming that they were old Dutch legends. In her book Possessions: The History and Uses of Haunting in the Hudson Valley, Judith Richardson argues that Irving’s famous stories, “The Legend of Sleepy Hollow” and “Rip Van Winkle” were, contrary his assertions that they were derived from Hudson Valley oral tradition, simply derived from the author’s imagination and inspired by his travels in Great Britain. Irving gave Americans a sense of unique folklore that they wanted, even if it was simply of his own making. While Irving’s first depiction of St. Nick may have been rooted in satire, it would be unfair to Irving to leave matters on that note. Eleven years later, in 1820, Irving published his most famous work The Sketch Book of Geoffrey Crayon, containing “The Legend of Sleepy Hollow,” “Rip Van Winkle” and other stories. Among these were several stories devoted to Christmas as he had observed it in England while staying at Alston Hall in Birmingham. 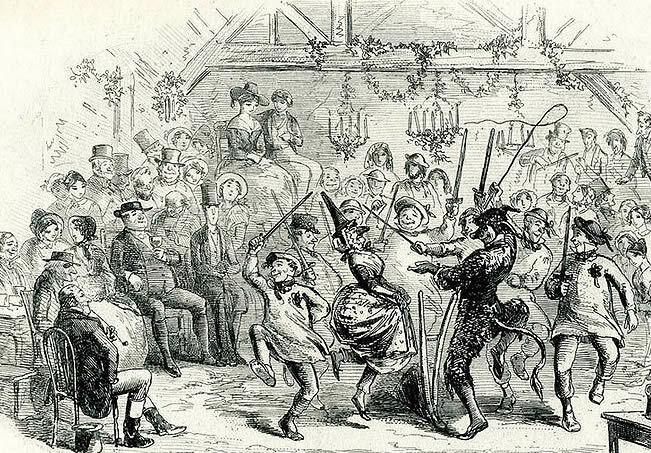 The tales are filled with truly heart-warming descriptions of a holiday that America had yet to widely adopt, but was celebrated throughout England. And the descriptions are sincere, free of satire. In my opinion, he rivals Dickens in his ability to instill Christmas cheer. I believe Irving truly loved Christmas. …In the depth of winter, when nature lies despoiled of every charm, and wrapped in her shroud of sheeted snow, we turn for our gratifications to moral sources…Our thoughts are more concentrated; our friendly sympathies more aroused, we feel more sensibly the charm of each other’s society, and are brought more closely together by dependence on each other for enjoyment. Heart calleth unto heart; and we draw our pleasures from the deep wells of living kindness, which lie in the quiet recesses of our bosoms…Christmas is still a period of delightful excitement in England. It is gratifying to see that home feeling completely aroused which seems to hold so powerful a place in every English bosom. The preparations making on every side for the social board that is again to unite friends and kindred; the presents of good cheer passing and repassing, those tokens of regard, and quickeners of kind feelings; the evergreens distributed about houses and churches, emblems of peace and gladness; all these have the most pleasing effect in producing fond associations, and kindling benevolent sympathies…Stranger and sojourner as I am in the land,—though for me no social hearth may blaze, no hospitable roof throw open its doors, nor the warm grasp of friendship welcome me at the threshold,—yet I feel the influence of the season beaming into my soul from the happy looks of those around me. Surely happiness is reflective, like the light of heaven; and every countenance, bright with smiles, and glowing with innocent enjoyment, is a mirror transmitting to others the rays of a supreme and ever shining benevolence. He who can turn churlishly away from contemplating the felicity of his fellow beings, and sit down darkling and repining in his loneliness when all around is joyful, may have his moments of strong excitement and selfish gratification, but he wants the genial and social sympathies which constitute the charm of a merry Christmas. Charles W. Jones, “Knickerbocker Santa Claus,” New York Historical Society Quarterly, October 1954. Brian Jay Jones, Washington Irving: The Definitive Biography of America’s First Bestselling Author, (2013), p. 92-94.